It's safe to say that Yoku's Island Express is the first pinball-Metroidvania game we've ever played. We sincerely hope it's not the last. 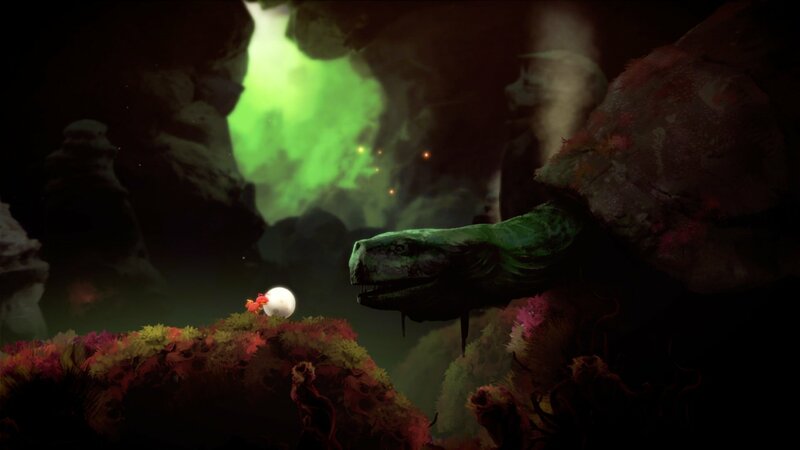 Swedish indie studio Villa Gorilla has produced an improbable mash-up that succeeds through an uncommon combination of charm and inventiveness. Beyond all that, though, it's just brilliant fun to play. You play the part of Yoku, an adorable little beetle who washes up on the mystical island of Mokumana just as things start falling apart. The island's lumbering god-figure has been attacked by a mysterious assailant, throwing its tribes into turmoil. Not only is Yoku tasked with filling the vacant postmaster role, but he also has to deliver the entire island from impending calamity. No pressure, then. Yoku can scamper to the left and right via the left Joy-Con stick, and interact with items and NPCs by pressing 'A'. However, the bulk of your interaction comes through a ball that Yoku finds himself tethered to early on. Mokumana island is a compact yet diverse place filled with dense jungle, chilly peaks, arid deserts and gloomy caves. However, the entire island is saturated with pinball paraphernalia. There are flippers that help you get to higher ground (activated with the shoulder buttons), bumpers that flick you off at an angle, and rails that loop up and around to new areas. 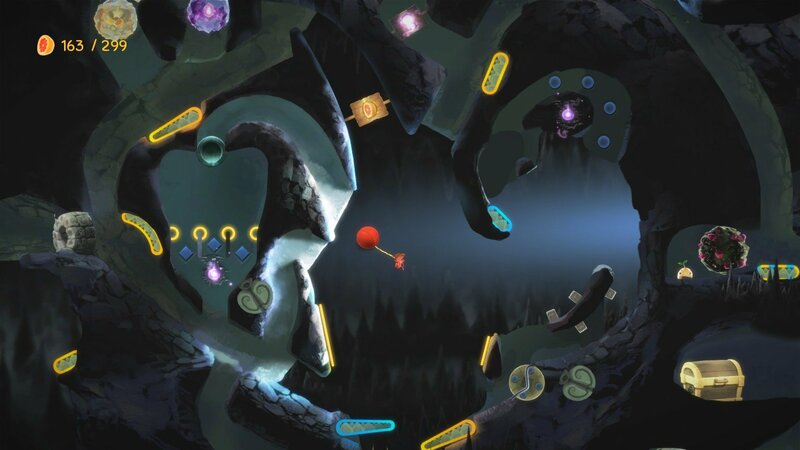 The pinball influence goes further than mere traversal mechanics, with each instance of what you might call a dungeon - where all of the game's key puzzles, trials and bosses are contained - essentially playing out like a fully-fledged pinball table. There are targets to hit, sequential switches to flip, slots to land in, and loads of bonus fruit currency to collect. It sounds like an unusual mix of ingredients, for sure, but it somehow never feels contrived. At no point did we wish we were playing a more conventional Metroidvania with regular 2D platformer controls. Besides the pinball physics being really well executed, there's a distinct lack of compromise here. All the key attributes of a Super Metroid-inspired game are present and accounted for. 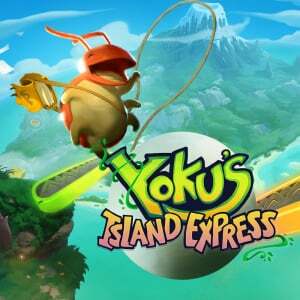 Yoku's Island Express isn't a particularly vast game, but exploration and discovery are at its heart. Heading to your next location on the map, you'll invariably encounter several tantalising distractions with the potential to divert your attention. Whether that's a secret room, a curious new character, a goody-filled treasure chest or one of the game's many collectable knick-knacks, your curiosity is always rewarded. Indeed, like all the best Metroidvania games, it's possible to approach many of its main tasks in an order of your choosing. Where you are forced to do things in a certain sequence, it's because you'll need to have acquired a particular new ability in order to progress past a certain barrier. Sound familiar? It would be a crime to spoil any of the game's surprises, suffice to say that Yuku's steadily increasing abilities are a delight to discover and utilise. It's a small roster, but each new piece of equipment is put to thorough use across the map - especially if you have a completionist streak in you. We've hinted at it already, but the thing that really knits the game's disparate elements together, and that stays with you in between playing sessions, is the beauty of its world. Mokumana has a gorgeous hand-painted feel to it, while its animalistic denizens are a wonderful mish-mash of shapes and sizes. 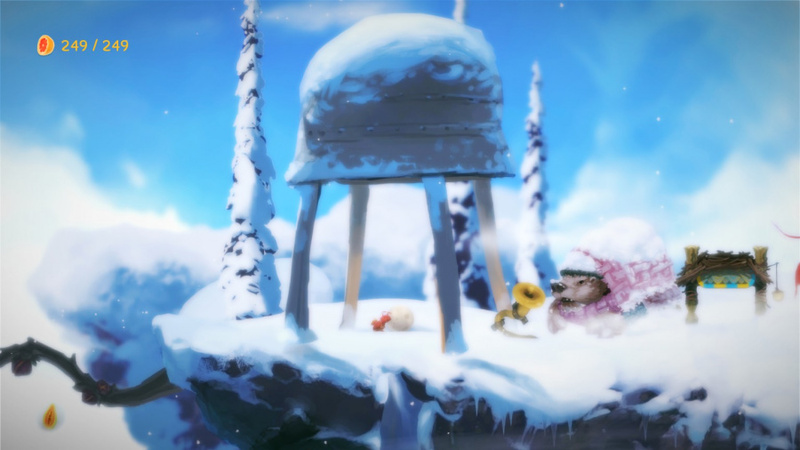 It feels like some fantasy collaboration between Jim Henson and Studio Ghibli, with a little Pikmin magic stirred in. The sound design is also tip top. Each creature has their own distinctive babble, which cuts through a background of gentle birdsong, pitter-pattering rain, or the harsh winds of an exposed mountainside. Accompanying all of this is a range of memorable analogue ditties, which we guarantee will find their way into your head at various points throughout the week. We should note that Yoku's Island Express is far from flawless. The game's map screen isn't particularly great, for one thing. Sure, it looks lovely, but it offers two less-than-optimal zoom levels, with the furthest being nigh-on useless in portable mode. This map screen doesn't label any of its locations either, which can leave you confused as to where you're supposed to be headed when the game occasionally communicates your next location verbally. Where exactly is the obtainium mine, again? 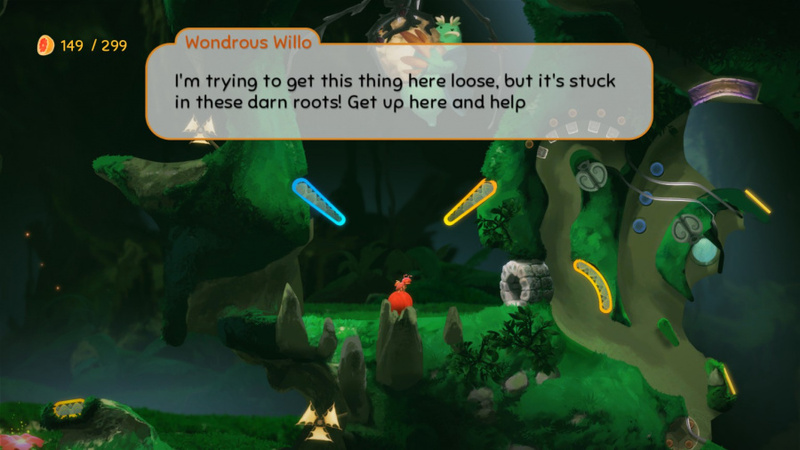 Indeed, the biggest points of frustration in Yoku's Island Express come with getting about the world. There's a very handy (and highly entertaining) shortcut system that slowly unfurls, but figuring out exactly how to get from A to B in the early to mid-game stretch can feel like groping around in the dark. It can especially grate on the odd occasion that you find yourself drawn back into an extended pinball section that you've already encountered. You're often not quite sure whether you're wasting your time in an area. Some of the game's collectible traversal mechanisms - a manual swing system and an explosive-retrieval system in particular - feel like they needed a little more fine-tuning, too. The amazing thing is that none of these flaws really matter in the final reckoning. There's just so much love and skill and charm on display here that complaining about a few navigation issues seems churlish. After the credits roll, all you'll be left with is a warm sense of satisfaction and a strong desire to experience your second pinball-Metroidvania game as soon as possible. I just don't see how this game would work so i have to take your word for it. To the wish list it goes. "You're often not quite sure whether you're wasting your time in an area." This, for me, can be the kiss of death in a metroidvania. Gonna wait for the physical edition, but otherwise and as expected this is a mandatory purchase for yours truly. I rarely do preorder things and I never preordered an e-shop-game (at all, but especiall not from a publisher I knew nothing about and not coming from an already tested series). But I did preorder this somehow since the mix sounded really interesting and fun to me and it looked like it was really well-crafted. Glad I apparently wasn't wrong! @Spoony_Tech I've played 27% now, and the game is brilliantly designed, and it works fantastic in both docked and undocked modes. Tip: play it with a BotW exploration mindset rather than rushing from A to B. 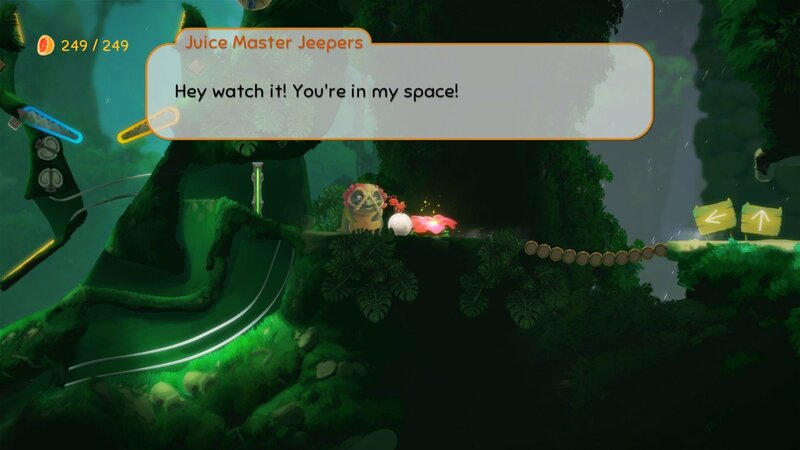 There are lots of side quests and characters to talk to, and even if you go from point A to point B you can play pinball on the way to collect more fruits (fruits is the main currency for unlocking things). And there are so many great details in the artwork of the game. I'm excited to play this.... unfortunately, it will probably not sell well due to its weird name and flying under the radar... and a somewhat high price for an eShop title. This is right up my alley and I almost missed it... thanks NintendoLife for bringing some attention to it. Can't play it at the moment with the backloggery, but certainly one to put on the 'get it in a sale for a rainy day' list. @Tibob Ah, the "Switch Tax". I can't say I am surprised. This looks really good. I don't necessarily like pinball games, but Metroidvania really has my interest since I played Hollow Knight and Ori and the Blind Forest, which I both really love. Really like the look of this one, wasn't expecting it to score this well so even better. Other reviews were a lot harsher. Especially about the swinging and backtracking parts. Was really intrigued by the description and trailer, so I preordered it as soon as I had the chance. Glad to see it lives up to expectations. Been eyeing this for a while. Got the physical version preordered. @SmaggTheSmug This is Nintendo Life. Every game gets a 9+ here. this sounds like a very satisfactory release in lieu of a new 1st party pinball game, I couldn’t be more pleasantly surprised by this release! I am close to finishing this. Really great game. It doesn't take long to beat the story, but it's filled with loads of extras as well. 40€ though on cart. I'll wait until it's less than 30€. I love the music in this game and the overall aesthetic of it. The world and its characters are all creatively and uniquely made. The gameplay is relaxing as well as just a fun time. I definitely recommend this game. I really want a demo for this game. Wanted this physical, but couldn't bring myself to pay a $20 premium to get it on cartridge. Bought digital for $20, and fell in love in the first 2 minutes of play. Cleverly done, excellent in the early stages, and smooth playing. Really enjoying this one. Will re-buy in physical form if it drops a good bit, but happy with the digital download for now. I LOVE how inventive and creative the Nindie community is! Awesome. Can't wait to play this when I get home! MetroidVania and Pinball? Two of my favorite genres. Nice. I think the price in the review is incorrect. Pretty sure the game is $19.99, not $17.99. Anyway, amazing game. I'm in for ANYTHING pinball, so day1 for me! @Spoony_Tech Yoku Island Express demo is fun. I'm not paying $19.99 for it, that's what I pay for games like Uncharted, Tomb Raider or Zelda, but it's about 15 minutes worth of fun. Also who should I tell that works here it's $19.99 when the website infobox on every article says $17.99? I have a couple of cool photos for you from my vacation, need to get them on twitter first. This is a very good game! It is addicting as hell. I finished it in two days, though I'm not sure how many hours I actually played (maybe 6 to 8 hours?). The game keeps on going and there is so much to discover, most of it by accident. I beat the game at around 80 %. I know there is more to do, but for getting 100% I think it will take a lot more time. Visuals are cute, I'm not a fan of the style but I liked the color palette. The audio is superb, the recording is very spacious. It adds a lot to the atmosphere (if you use good headphones). The final boss music is awesome! The game crashed on me once and threw me back to the home screen. Two times the loading took very long. Also, the audio very rarely cuts out altogether. Nothing game breaking, though, but I do expect a patch in the future. Fun game, highly recommended! It didn't quite push me like Hollow Knight to get 100%, but I had just as much trouble putting it aside. I will definitely revisit this game in a few months (after patches, maybe added content) and go for the real ending. Great game! It plays a lot like Nintendo Land’s mini-game Donkey Kong’s Crash Course.